The buildings on this site are as complex as the extraordinarily rich history they illustrate. Historians believe that there had first been a temple to the Roman god, Janus, on this site. The temple was converted into a church by invading Visigoths who seized Corboba in 572. Next, the church was converted into a mosque and then completely rebuilt by the descendants of the exiled Umayyads—the first Islamic dynasty who had originally ruled from their capital Damascus (in present-day Syria) from 661 until 750. Following the overthrow of his family (the Umayyads) in Damascus by the incoming Abbasids, Prince Abd al-Rahman I escaped to southern Spain. 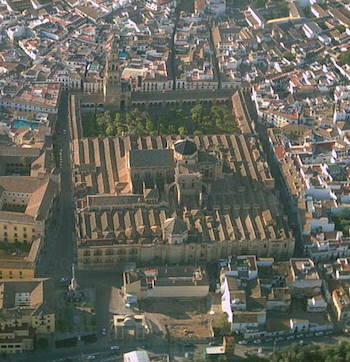 Once there, he established control over almost all of the Iberian Peninsula and attempted to recreate the grandeur of Damascus in his new capital, Cordoba. He sponsored elaborate building programs, promoted agriculture, and even imported fruit trees and other plants from his former home. Orange trees still stand in the courtyard of the Mosque of Cordoba, a beautiful, if bittersweet reminder of the Umayyad exile. The building itself was expanded over two hundred years. It is comprised of a large hypostyle prayer hall (hypostyle means, filled with columns), a courtyard with a fountain in the middle, an orange grove, a covered walkway circling the courtyard, and a minaret (a tower used to call the faithful to prayer) that is now encased in a squared, tapered bell tower. The expansive prayer hall seems magnified by its repeated geometry. It is built with recycled ancient Roman columns from which sprout a striking combination of two-tiered, symmetrical arches, formed of stone and red brick. The focal point in the prayer hall is the famous horseshoe arched mihrab or prayer niche. A mihrab is used in a mosque to identify the wall that faces Mecca—the birth place of Islam in what is now Saudi Arabia. This is practical as Muslims face toward Mecca during their daily prayers. 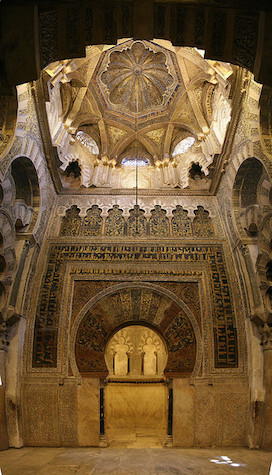 The mihrab in the Great Mosque of Cordoba is framed by an exquisitely decorated arch behind which is an unusually large space, the size of a small room. Gold tesserae (small pieces of glass with gold and color backing) create a dazzling combination of dark blues, reddish browns, yellows and golds that form intricate calligraphic bands and vegetal motifs that adorn the arch. The horseshoe-style arch was common in the architecture of the Visigoths, the people that ruled this area after the Roman empire collapsed and before the Umayyads arrived. The horseshoe arch eventually spread across North Africa from Morocco to Egypt and is an easily identified characteristic of Western Islamic architecture (though there are some early examples in the East as well). Above the mihrab, is an equally dazzling dome. 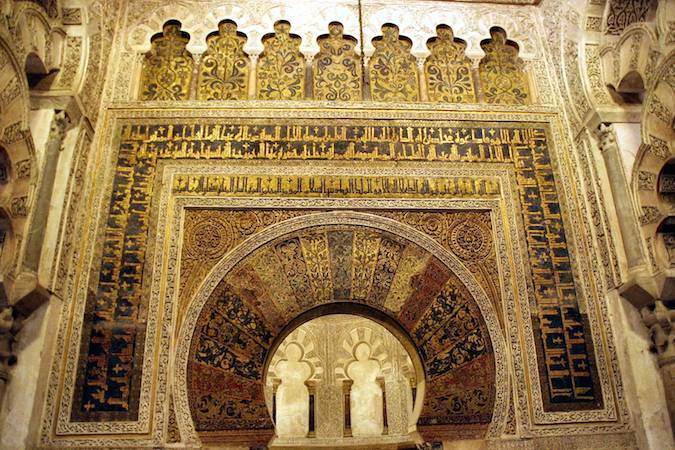 It is built of crisscrossing ribs that create pointed arches all lavishly covered with gold mosaic in a radial pattern. This astonishing building technique anticipates later Gothic rib vaulting, though on a more modest scale. 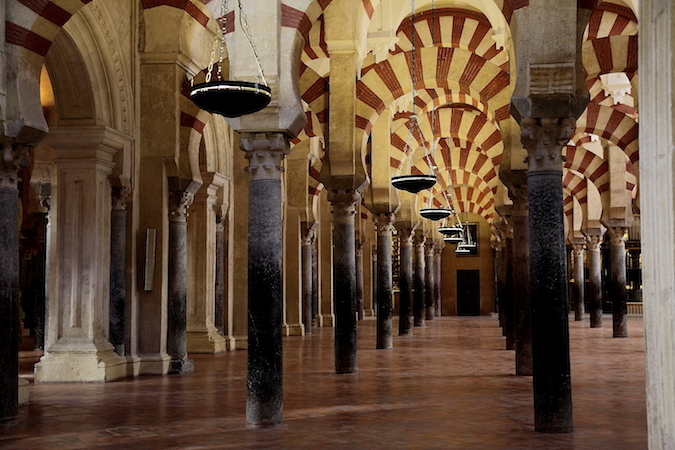 The Great Mosque of Cordoba is a prime example of the Muslim world’s ability to brilliantly develop architectural styles based on pre-existing regional traditions. Here is an extraordinary combination of the familiar and the innovative, a formal stylistic vocabulary that can be recognized as “Islamic” even today. Cite this page as: Shadieh Mirmobiny, "The Great Mosque of Cordoba," in Smarthistory, August 8, 2015, accessed April 19, 2019, https://smarthistory.org/the-great-mosque-of-cordoba/.